A grave injustice has occurred. Merriam-Webster’s Dictionary has failed to identify the etymology of the verb “to doodle.” They correctly define the word, “to scribble mindlessly,” but trace the origin to a 16th century noun, a doodle or dolt, or other roots. Poppycock. 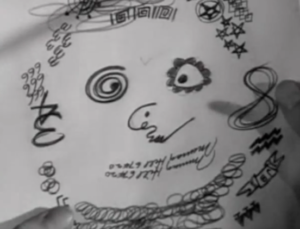 “To doodle” was the invention of Robert Riskin and comes from the courtroom scene in Mr. Deeds Goes to Town when Deeds explains he’s not crazy, that he plays the tuba to relax just like other people do other things to put themselves at ease. The camera focuses on a man who is scribbling who Deeds points out “doodles” to relax. This, he explains, doesn’t mean he’s crazy. Nowhere in recorded history had the word “doodle” been used as a verb until then! My father was a serial word-inventor and floated another new word in Magic Town (1947) with Jimmy Stewart who tells Jane Wyman not to be a “whineyworm”. Hollywood, June 27 – (UP) – Writer-Producer Robert Riskin hopes when future historians tally things up they’ll remember him as a noble contributor to the culture of our civilization. No, he doesn’t mean his screenplays like “Lost Horizon” or “It Happened One Night.” Nor his system for beating the dice (submitted upon request) that he invented when a lad of 14 in New York. He means the word “doodle.” Mr. Riskin, he informed us with dignity, invented it. Of course, the word was used centuries ago to describe dolts, cheats and bagpipes but it died unknown to Mr. Riskin and the modern world. So no matter what anybody else claims, he coined “doodle” so people would know what they’re doing on phone booth walls, tablecloths and last month’s bills. Before you beckon for H.L. Mencken, please give the floor to Mr. Riskin. He never thought of mounting the podium in his defense before, he emphasized. Even when he read countless books confidently insisting the word was derived from the ancient Anglican, “dwadle,” the Russian, “doukhobortsy” or the Romany-Gypsy “Duzee.” Riskin would just smile condescendingly and scoff oh, well, what’s a word. Then he began to ponder. Well, what is a word? A word, he decided, will be remembered long after Riskin’s pictures are tramped to oblivion by ensuing generations of movie-makers. Centuries hence, he went so far as to think, the future man will be doodling but will he see Riskin’s movies? Robert knew that the time had come for him to speak. “It was this way,” Bob said with his eyes modestly averted. “Back in 1935 I was writing a screen play called ‘Mr. Deeds Goes To Town.’ In one scene I figured I’d have the hero prove his sanity at a trial.” To do so, the hero, who turned out to be Gary Cooper, was to show his doodlings to the court and prove that the Judge and the lawyers doodled in the same fashion, too. Bob was stumped for a word to describe the subconscious scribblings. “I made a list of possible words,” he explained, “like piddling, pawdling, dawdling, foodling – and then suddenly it came to me! Doodling! It sounded just right, just right!” The cast of the picture accepted Riskin’s new word without so much as a questioning lift of an eyebrow. The word fit the action so well the players figured they’d known it all the time, Riskin reflected. “After the picture was released the entire country accepted doodle as part of the English vocabulary,” he said with pride. “People came to believe it was an old slang expression when in truth I had thought it up.” “Doodle” isn’t in the dictionary yet, except in old ones as it pertains to dolts, cheats and bagpipes. Riskin’s project for the year will be to get the Webster people to include his version. Mr. R was so pleased with his first new word that he slapped another in “Deeds.” That was “pixilated,” meaning slightly off one’s trolley. Now he slips new words into all his screen plays. In the latest movie Riskin wrote and produced, “Magic Town,” he has Jimmy Stewart trying to “pungle up” some money and calling Jane Wyman a “whineyworm.” “Pungle,” explained the word inventor, means fork over. “Whineyworm,” means, well, whineyworm. My daughter Daniela, now 47 yrs., was given the nickname “Doodle” because from about 2.5yr she began constantly draw in a variety of medium. She began by placing the paper on the floor, and squatting to create, usually without confining clothing.